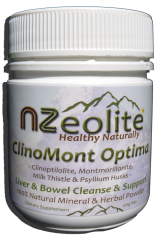 ClinoMont Optima is a mineral and herbal blend of powerfully cleansing Zeolite, soothing Bentonite, liver protecting Milk Thistle and bowel-sweeping Psyllium Husks. Add 1tsp. (4g) to a glass of water up to 3x daily, one hour away from food. Stir and drink immediately. Drink plenty of pure water to improve results. 240g size contains 60 servings of 4g each. Warning: If you are pregnant, nursing, taking medication, have a medical condition, or notice unusual effects, consult your health professional and/or discontinue use. Please refer to our Disclaimer.